Meets on Tuesdays at 7:30 pm in Hub Leisure Centre, 405 Kilbowie Road, Clydebank, G81 2TX. 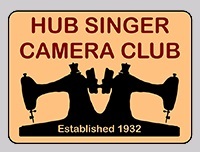 The Club was formed in the 1930's in the Singer Sewing Machine Company and in its early years was a male only club. The closure of Singer led to the club's present home in the Hub Leisure Centre, Clydebank. The Singer name lives on in the club's title. A full and varied programme is followed where members are encouraged to enter monthly club competitions and invited guest speakers give interesting and inspiring talks. The club has moved with the times and now fully embraces the new digital technology in the photographic world with members producing quality digital prints and projected images. The club is a member of the Glasgow District Photographic Union and competes in GDPU inter-club competitions, which give members an opportunity to visit other clubs and cast an appraising eye over their work.